NOTE: When installing the t-pins, make sure they don’t cross the copper contacts on the LED ribbon. This will cause a temporary short, and your lights won’t come on. Lighting kits for safes can be expensive, but you can install bright motion-activated LEDs yourself for about $30. This video shows you how with no need for cutting or splicing a single wire. The whole system is plug and play. Yes, you can buy a rechargeable battery to run these lights in places without power. This lithium ion battery will power the strip for about two hours of total runtime between charges, which could easily be months of opening and closing your safe. Comes with charger. You can also install an outlet kit yourself if you’re willing to drill the necessary hole, which is exactly what the safe manufacturers do to install these. 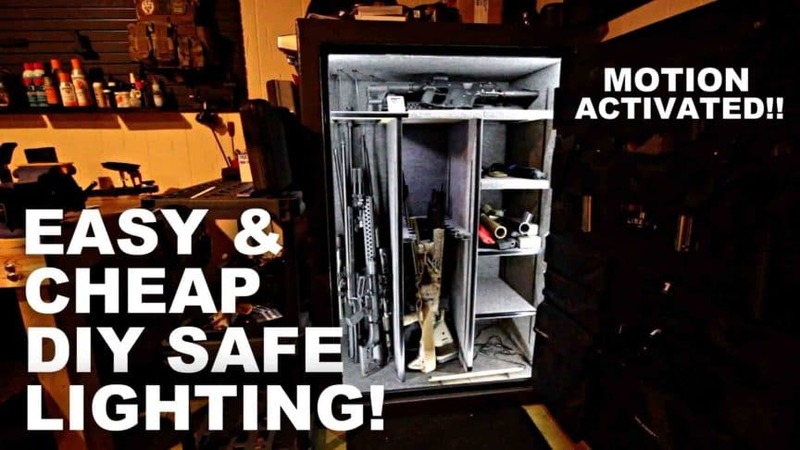 The best is the one that came standard with this Liberty safe.